A compact, versatile dust collector, the SAFE Systems DC9500E is powered by a belt-driven 30 HP electric motor. The fan and dust collector are rated at 9,500 CFM @17” WC. The fan is equipped with an inlet damper for regulating the airflow. The skid-mounted 9500 CFM dust collector has both lifting eyes and forklift pockets for handling by either crane or forklift. The legs are extendable so a standard 55 gallon dust barrel can be placed under the slide gate for easy dust emptying. 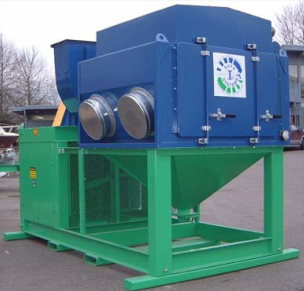 The unit has (2) 18” diameter dust inlets on each of two (2) sides to give the user greater versatility. Only two (2) inlets are to be used at a time. The dust collector utilizes twelve (12) MERV 11 rated filter cartridges which are cleaned by an automatic reverse compressed air pulse cleaning system. 30 CFM of 90 PSIG compressed air is required for the reverse air flow pulse cleanging system. Forklift pockets, located on 12' side of collector for handling by a forklift. Certified lifting eyes for handling by overhead crane. Fan and dust collector rated for 9,500 CFM @ 17” W.C.
Four (4) dust inlets, 18” diameter, only two to be used at a time. Fan is belt driven by a 30 HP, 460-volt, 3-phase electric motor. 460 volt AC control box. Slide gate on the hopper dust discharge. Dust discharges in standard 55 gallon drum (drum to be supplied by customer). 25’ of properly sized SO cord for electrical hook-up. Not intended to be shipped with any dust in collection hopper. Recommend emptying dust every 2 to 4 hours depending on the dust collection rate. It is recommended that a qualified electrician connect this equipment to power. Have electrician verify correct fan rotation after connection. If operating this equipment using a generator, check with the generator provider to ensure proper sizing. We recommend at least a 75 KW generator for this piece of equipment. We recommend shipping this piece of equipment on an open flat bed truck or trailer. Shipping in an enclosed box van or trailer is not recommended.